One of the aims of the project is to make nature protection more logical and natural for people. The best way to understand why protection is needed is to see and try things yourself. To make this opportunity available we will organize several study and nature conservation tours. During these events people can do a good deed for nature and give sense to different nature protection activities. A study published last year shows that 96% of the participants learn something new from nature conservation holidays and almost every single participant gets positive emotions and good feeling. You can read more about the survey here (in Estonian). From 19th of July until 22nd of July a traditional nature conservation summer school was organized. 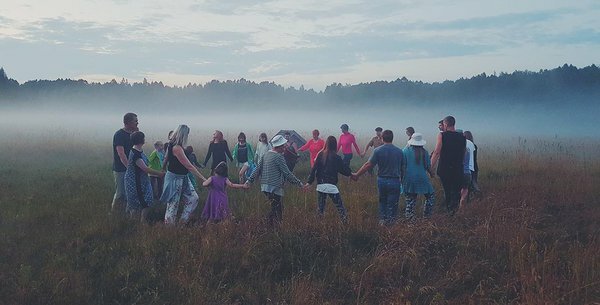 It was a fifth time when a group of nature protection enthusiasts gathered in the middle of the summer to make hay with scythes, listen to different interesting presentations and folk music and most of all enjoy a good company. Summer school took place in Palupõhja, Tartumaa. This is a place in the middle of Alam-Pedja Nature Reserve. All the activities took place around Palupõhja Nature School, including making hey. All of the participants had a chance to take part of the whole cultural program - music, movies, story telling, observations. From 22nd of July until 24th of July the summer school was extended with another couple of days to finish all of the hey making which was left undone.